Post frame construction is a simple building technique that is adapted from labor intensive conventional timber framing. A post frame shed is made from large poles that are buried into the foundation. This is done to provide the vertical structure with support. A shed is a type of building that is a simple, one story structure that is adapted into the backyard for additional storage. Normally items are stored in a shed such as gardening and yard tools, hobbies, and workshop materials. 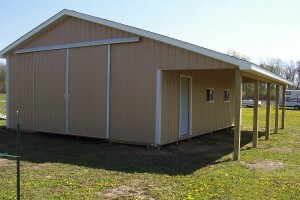 Custom sheds can house all sorts of things depending on the size. Some people have even gone as far to store motorcycles and small water crafts in them to avoid being stolen and protection from the weather. Sheds have lots of uses to say the least. You can save money by having a shed built on your Adrian property. A custom builder can have a shed built for you, to your specifications, the color and style you want in no time at all and early enough into the year that you can fill it up before spring. Storage facilities cost money. Many homeowners go this route whenever they have nowhere else to store their goods. This is a safe and proven way to protect items that are too big to put into the home. A custom shed can save you money by not paying for storage. Many turn to having shed built for workout purposes. There is an ongoing trend in getting fit. Some turn to gyms while others have a smaller version built on their property. Sheds can be great places to host workout studios. Custom sheds are uniquely built. They can be adapted to size depending on the purpose. Sheds can be built with electricity for workshop needs and they can even have small second story created for additional storage. Through frame construction, there is a faster erection time. The wood posts are larger therefore cutting the time in half. Traditional studs are used in the construction and the structure can withstand larger loads. Call Omni Builders for more details on how you can take advantage of a post frame shed. One of these will increase the value of your property and create a structure where you can store your belongings. If you are looking for an experienced post frame shed expert in Adrian then please call 517-486-3784 or complete our online request form.